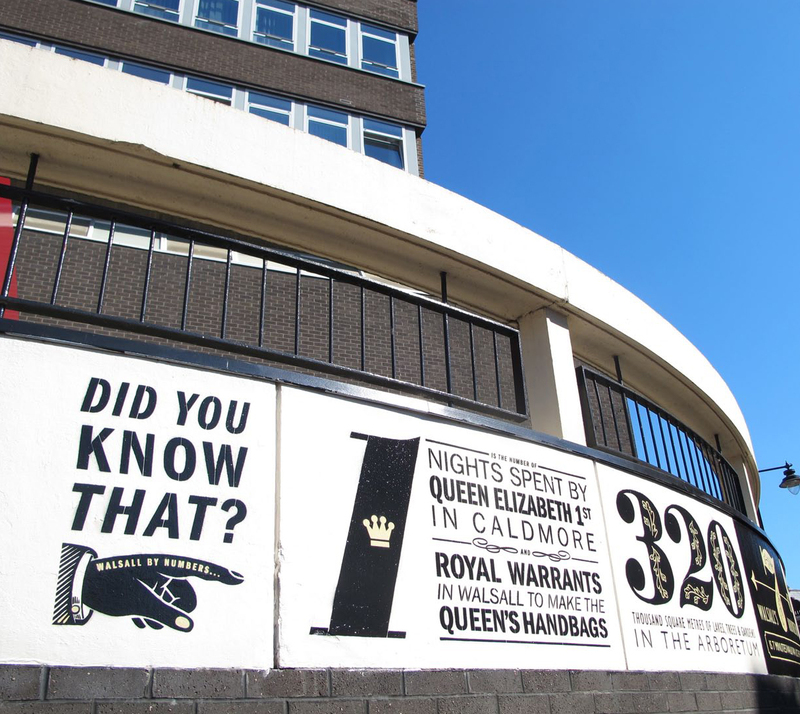 Walsall Metropolitan Borough Council commissioned URBED and artists/ branding specialists, United Creatives to create an overriding wayfinding strategy though public art. The work was informed by consultation with wider stakeholders including traders, businesses, West Midlands police and the general public. The final strategy reviews how people navigate the town centre, from their approach and arrival to their patterns of circulation, and assesses how to make way finding around central Walsall easier for all. With footfall being the lifeblood of Walsall’s retail core, the primary objective was to support existing busy footfall routes, and open up underused ones. The overarching aim was to help Walsall present its varied asset base as a more unified town centre offer. The Strategy reviews different techniques for improving way finding, sets out what Walsall has to gain by embracing the concept, and provides an analysis of the town’s challenges and opportunities. Finally, it offers a strategy and action plan to guide action when resources become available. There were two major artistic installations completed as part of this work. They can be seen in the images below. United Creatives recently completed their first installation of a hand painted wall mural whiahc stretches along a 22m long, (previously dull) patch of concrete and not only acts to direct pedestrians to some of the towns hidden gems, but also engenders civic pride by conveying some interesting facts about the town. There are some more common facts that residents may know and others that are slightly more obscure. Read more about it in the Press release written by United Creatives on the right. This project has received positive press and is being enjoyed by the public in Walsall town centre. It is great that the first project has been implemented as it demonstrates to the public that progress is being made with wayfinding in the town. Plans are on the way to get a second project, the canal townpath art work implemented. This Wayfinding Strategy Document - ‘Walsall’s Way Ahead’ - reviews how people navigate the town centre. We have looked at all stages of people’s routes round town, from their approach and arrival to patterns of circulation, and assessed how to make way finding around central Walsall easier for all. With footfall being the lifeblood of Walsall’s retail core, the primary objective has been to support existing busy footfall routes, and open up underused ones. The overarching aim is to help Walsall present its varied asset base as a more unified town centre offer. This Draft Strategy reviews different techniques for improving way finding. It then sets out what Walsall has to gain by embracing the concept, and provides an analysis of the town’s challenges and opportunities. Finally, it offers a localised strategy and action plan to guide action as resources become available. 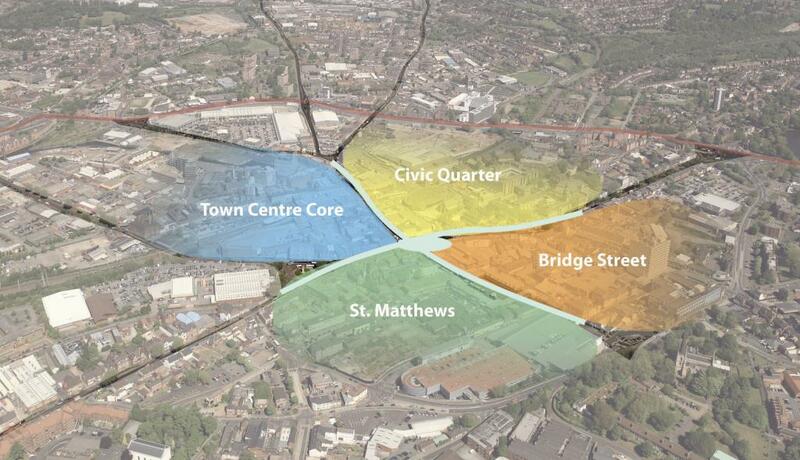 We have based our ideas around the ‘Clover-Leaf’ shape that underlies the town’s street map. ‘Spatial artistry’ can create a memorable town. Art can play the roles of ‘orientation and information’ - and also stimulation. In other words, it is both easy to naturally navigate the streets, and also to gain awareness of what makes the town tick. We would like to thank the Steering Group of council officers and stakeholders from the College, Art Gallery and Manor Hospital. 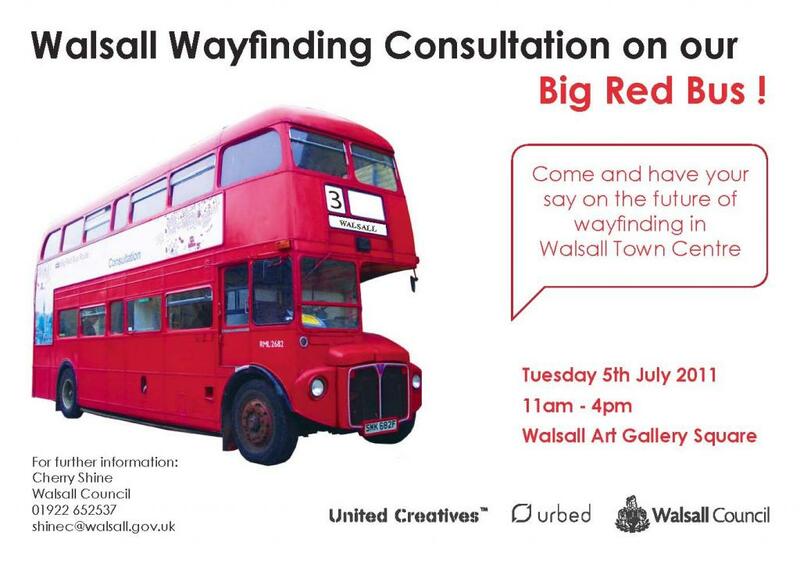 Our work has also been informed by consultation with wider stakeholders in Walsall, including traders, businesses, West Midlands police and the general public. Park Street is Walsall’s premier shopping area. Its scale, buildings and proportion are the equal of many ‘big city’ shopping streets, and it retains a good range of retail brands. Overall, it remains a successful example of a pedestrianised high street precinct. However, the form and function is badly spoiled by an excess of intrusive street furniture. Around the Saddlers centre, such clutter is so dominant it reduces the proportion of the street available to pedestrians to around a quarter of its actual width. People are squeezed into a narrow section when they should be able to roam easily across the entire width of the space.Sightlines are also heavily disrupted, which is likely to deter comfortable footfall. Park Street is just one example of a street spoiled by clutter. A roundtable discussion was held a week ago. The results were really interesting, with the good people of Walsall receptive to constructive critique and welcomde ‘fresh eyes’ looking at the centre of the town. The results show a strong desire to create a "future heritage", as much as celebrate the history of the area and a need to reflect and celebrate the town’s cultural and ethnic diversity. Also identified was the opportunity to ‘look out as well as in’, to pick up nearby community assets like Caldmore ‘curry trail’, Bloxwich’s theatres, the Arboretum and Reedswood Park in Birchills, and the need to sort out gateways and approaches as a high priority – the road routes and public transport hubs do not express a consistently positive welcome, and the relatively low cost ‘decluttering’ of the streetscape was seen as a sensible early move. There was also a public consultation held on our big red bus.